Our news can now be found on our sister website at www.CentaurRising.org/page/news.html. Follow us also on Facebook, where you can see, for example, the over 40 wildflowers that bloom on the grounds of Anchorage Farm. Please click here for our 2011 family holiday letter. We are pleased to announce that the Mountain Area Land Trust (MALT) has decided to host a portion of the events of its 2007 "Conifer Tales & Trails" at Anchorage Farm! This event will be held Saturday, September 8, at various locations in the Conifer area. A "celebration of cowboy poetry and music, storytelling and our Western heritage" will benefit MALT, a foothills non-profit dedicated to land preservation in the mountain areas of Jefferson, Park and Clear Creek counties. Equestrian activities at Anchorage Farm are operated by a 501(c)(3) organization called "Centaur Rising". Centaur Rising’s News page features the equestrian news at Anchorage Farm. Brooke DeVore's new horse, Wild Magic LHF, has a median score of 70%+. As of August 24, he is ranked fifth in the nation by the United States Dressage Federation Junior/Young Rider at Training Level. "Magic" won a reserve high point award at Dressage at High Prairie, his very first show! Magic finished the show season by winning the United States Dressage Federation, Region V, Championship, Junior/Young Rider, Training Level: and was named the Rocky Mountain Dressage Society's Reserve Champion, Junior/Young Rider, Training Level. Brooke has also done an outstanding job showing Kris Cooper's horse, Donntano, at First Level. Donntano was on August 24 ranked 3rd in the nation at First Level Junior/Young Rider. His current median score is 67.38%. Donntano won high point Junior/Young Rider at the Autumn Hill Dressage Festival with a score of 71.471% and finished the show season by being named the Rocky Mountain Dressage Society's Reserve Champion, First Level, Junior/Young Rider. Claire Filkins won high point Junior Young Rider at the previous Autumn Hill show on July 10 with her mother's horse, Rhythm and Blues. It was also "RaB's" first show! Claire also shows her own horse, Rogue's Respiro. Pam DeVore has so far this year won four Dover medals with her horse, Abraham, shown at second level. Approved Riding Schools of America. We're proud to say the inspectors did too! Donntano is a son of Donnerhall. His mother is a sister of Brentina, the 4th place dressage horse in the 2004 Olympics. They are both daughters of Brentano II. "lovely harmony and expression" "lovely attitude" "great hind leg" "smooth"
Pam DeVore for winning the Rocky Mountain Dressage Society's 2003 Grade Breed Award with her horse Abraham. Abraham has recently been branded and approved by the American Warmblood Society for earning a 64% at first level, test four, at a United States Dressage Federation show. Katryna Evans for winning the Rocky Mountain Dressage Society's 2003 Horse of the Year, Junior/Young Rider Horse of the Year, Training Level Reserve Champion, with her horse Roswell Wizard. 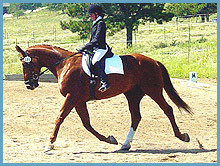 Aldeberon for winning the Rocky Mountain Dressage Society's 2003 Horse of the Year, Junior/Young Rider Horse of the Year, Training Level third place - also second place in the United States Dressage Federation's 2003 Westfalen All-Breed Award at Training Level. Garion Evans' horse Camelot for winning first place in the United States Dressage Federation's 2003 Oldenburg All-Breed Award at Training Level, Junior/Young Rider. Brooke DeVore's horse Rio Bravo for winning fifth place in the United States Dressage Federation's 2003 Westfalen All-Breed Award at Training Level. Also, riders winning 2003 Rocky Mountain Dressage Society's, Horse of the Year, Jr/YR Champions at both First Level & Second Level are both former students of Anchorage Farm. Congratulations Kim Elsner and Christina Rudman! I was going to my ancestral homeland, though it was a place I'd never been before. The history of this place and of these people goes back thousands of years. It is the history of my people. Yet I do not know it. Their language I studied 40 years ago. Yet I've never used it. As soon as I was there, however, the place was familiar. As if I'd always lived there. Although I've owned, trained, shown and even bred horses over the last fifty years. It was not until the last one year that I have received a glimpse of how much more I have YET to learn. We imported eight warmblood horses from Germany in the last twelve months. Yet I knew little of their backgrounds. I know they are uniformly beautiful - in their faces, in their bodies, in their gaits, in their minds and in their hearts. Long a lover of Arabian horses, I was not about to give up the pretty alert faces and the human connection that Arabians give you. However, the warmblood horses we have imported for our clients are everything the Arabian is and so much more. How did they get that way? It was a trip in search of the answers. When we traveled to Warendorf, we walked in limestone stables and riding halls that had been there for 250 years. Many of the German warmblood registries go back hundreds of years, setting down exacting standards that have perfected the breed. As a former horse breeder in the United States, my experience has been quite different. Like many of my peers I have chosen stallions for comparatively capricious reasons. Stud manager here can stand studs without the rigorous tests under saddle as in Germany. Foals can be registered in many breed registries here without visual inspection. The German horse breeds have been systematically developed as working horses. The military helped impose standards that created superb war machines. The Germans have used culling far more rigorously than Americans - especially with regard to temperament. We Americans tend to work with (and even breed) whatever we have. The Germans would have culled out a non-responsive temperament hundreds of years ago. They just don't reproduce bad actors or bad movers like we do. Simultaneously, standards have been developed in Germany for the accreditation of horse trainers and riding teachers. In the US anyone can say he or she is a horse trainer or, for that matter, even a teacher of horse trainers. Fads come and go. Anyone can claim to be an expert, using any methods - even ones he's invented himself. Who can dispute him? In Germany a three-year apprenticeship is de rigueur before one can dare venture to take the Bereiter (professional rider) exam. For non-Germans in Germany, it is six years. A minimum of another three years under the supervision of one or more Masters (riding teacher) is required before taking the Master's exam. Not only in the exams but also throughout their apprenticeships, candidates are under continuous and rigorous scrutiny. Once certified, the German professionals all teach and train according to the same system. When we visited Stall Ramsbrock in Menslage for six days, we saw how hard the apprentices, Bereiters, and Masters work. Ten horses per day per rider is the norm. Bereiters and apprentices not only ride these horses, they fetch, groom and tack them. Consequently these riders are lean athletes with no wasted movements or idle chatter. No couch potato riders here! My husband and I have long since learned that one must drive the German warmblood horse. No throughness is possible without first an independent seat and then conscious consistent human drive. Without throughness there can be no genuine contact with the rider's hands. Suppleness and impulsion cannot be developed. The German riders drive. After seven years of ten horses per day, they can really drive. It is interesting to see how riders develop under the system. First-year apprentices can be distinguished from third-year apprentices. Masters are also easily identified. How? By the willing and attentive looks in their horse's eyes. By the suppleness of both horse and rider. By the way the rider uses his/her hands. The new apprentice may, even if momentarily, use the reins for his/her own balance - on the big-moving young horses. The third-year apprentice and Bereiters drive the horse into their hands. The Masters invisibly and sympathetically feel and modify with their hands. How often we Americans get the "cart before the horse". We work on patterns, and movements before we've perfected vorwarts and rhythm, on contact before we've given sufficient attention to relaxation of the back. I catch myself making these mistakes. Hopefully I can recognize and correct them when I do. OK so I understand a bit more about German warmblood breeding and about German riding. But how do the horses develop those wonderful manners, that willingness to please? Our last full day in Germany we happened to witness a procedure that occurs every six-to-eight weeks at Stall Ramsbrock. Hooves, manes and tails were being trimmed on over 100 yearlings. Let there be no doubt. The German handlers are professionals. Gentle consistent firmness is the rule. It is we Americans who can be the beneficiaries. We can choose to learn about the German training system. We can choose to import and buy one or more of these fabulous horses. Only then can we advance even partway to the German's international dressage superiority that has been 2000 years in the making. It's where my ancestors came from. It's a system we are learning. It feels like home to me. This article was originally written as a response to a plea in the Jr/Young Rider Report in the May 2002 Rocky Mountain Dressage Society's Centaur for advice about how to handle kids in the barn. It also responds to an article in the November 2002 USDF (United States Dressage Federation) Connection, "An Incomplete Education". When I started as a fulltime professional riding instructor eleven years ago, I soon developed a following of junior students. We can all empathize with their yearning to "spend more time at the barn". It wasn't long before parents were dropping their kids off for longer and longer periods of time. There were many requests for kids to "work in exchange for riding". We adults soon realized that supervising kids is a lot more work than actually doing the work ourselves. One of the parents suggested we start a summer Horse Camp program. The original intent was to provide a structure whereby kids could be at the barn and work in exchange for riding lessons under adult supervision. As our more advanced juvenile students progressed, we used them to supervise and teach the less experienced kids. We also have developed a horse-leasing program. It has evolved as follows. 1) Intermediate level students are given the opportunity to lease a school horse when they have reached a level of competency that the horse does not backslide in his training. 2) As a student progresses, he/she is given the opportunity to lease a less experienced horse on the premise that he/she can actually help further the horse's training. 3) Advanced students also lease relatively green horses, giving them the opportunity to learn to train young horses. All lessees and boarders are required to take riding lessons. Visiting clinicians have often said to me, "You can't expect a child to have the strength.." or "…to have the understanding". I would accept such a comment as a personal challenge, because I believed that you COULD expect a child to do these things. I wanted to show the clinician by the time he/she returned that the junior HAD accomplished these things. Alex was also impressed with the level of riding and understanding of our junior riders, not just in their performance in one lesson but in their advancement from one clinic to the next. Now that Alex has been here eight times, I can see how it is all paying off - the understanding of theory that comes from teaching others and from training a horse oneself. I also firmly believe in starting riding students as pre-schoolers/kindergarteners. By the time a child reaches first grade, he is exhausted simply by a full day of school. Second- and third-graders advance in our After School and Horse Camp programs. Fourth-graders are ready to lease a horse. Many fifth-graders are ready to own their own horses. If a parent waits until a child is eleven or twelve before he/she starts riding lessons, the child is all too soon whip-sawn by peer pressures, self-consciousness, growth spurts, hormonal changes and myriad of school activities. Kids who start as pre-schoolers and who are nurtured along through our programs are often able to weather the inevitable teenage tempest. When my husband and I went to Germany in January 2003, we observed lessons at both public and private stables. We also observed horse training. I am convinced that many of our 12-14-year-olds can ride green warmblood horses alongside the 17-22-year-old German apprentices. It's not just the seat lessons and the saddle time. Our kids understand theory. They have had the opportunity to ride green horses. Now that we have eight German horses in our barn, they can participate in the training of big-moving German horses as well. Four of our students, ages 12-15, have been accepted by the German state riding school ("Landeslehrstatte") in Vechta for a horse camp ("Sommerferienlehrgang"). At the end of a two-week training period, they will have the opportunity to take the German federal exam for their little Bronze medal ("Reiterabzeichen") that will enable them to compete in German horse shows. The girls will also ride with the apprentices at a private training stable under the supervision of one or more Masters. This experience will open the door to international dressage riding for these girls. It will also expose German professionals to the caliber of riders we are developing in the US. It is Alex's fervent desire that one or more of our students become an apprentice in Germany after they complete High School and that they go on to complete (and pass!) their Bereiter's exam. Alex says that he has never had the opportunity to work with junior dressage riders like those in our barn. He feels that there is much potential for our students to bring back international knowledge and experience to the United States. It is the best way, in his opinion, to elevate riding in the United States to European standards. "You can't expect a ten-year-old to train a horse…" ""You can't expect an eleven-year-old to understand the theory…" "You can't expect a twelve-year-old to appreciate the magnitude of an international opportunity…" I think you CAN! When a child is treated with respect and high expectations; gossiping, loitering and carelessness fall by the wayside. These patterns were extinguished at Anchorage Farm before many of our students were born. The articles written by Alex Wortmann published in the Centaur in 2001 intrigued me. I had been studying dressage for twenty years and teaching it for ten. I had read the books of the Masters. I had started dozens of horses. I'd been through the entire USDF instructor pre-certification process, including the exam. I could mouth the concepts; recite the training pyramid in German. But what did it really mean? Alex seemed to explain and apply the principles better than anyone I had read. Alex articulated - both in his writing and in his teaching - a system, not a hodgepodge of different instructors, clinics, books and articles. As I say on our website, I regard dressage as a search for the "truth". What knowledge, skills and application, in what order, can best produce the elusive feeling of throughness, of oneness with the horse? My first clinic with Alex was an eye opener. He offered no quick fixes or gimmicks. Yet the improvement of the horses was evident. This was the first clinic that opened the door to the idea that training is serious work - for the rider as well as for the horse. There are several observations to be made: 1) Is the rider fit enough to adequately work a horse? 2) Is her seat sufficiently independent so that her hands do not interfere with the horse's mouth? If these first two conditions were met, an amazing thing happened. The horse became supple - not through flexing, bending and lateral movements, but simply through warming his muscles, joints and connective tissues. It was rhythm, relaxation, and then contact - exemplified. When I later applied this approach to my own training horses, I could see that it worked. Oh sure, we all know that every workout (horse or human) should include a warm-up phase, a work phase and a cool-down phase. But I'm not sure I understood what a warm-up really was. I recall going to a dressage show several years ago. Two women came into the (thankfully large) warm-up arena on two big ill-mannered horses. The horses were bucking and pitching. I thought, "This is not going to work. Somebody is going to get hurt. Someone should tell these women they must leave." But after 10-15 minutes of cantering, another amazing thing happened. The horses calmed down! They were on the bit. They were ready for the work phase. Clearly the above two conditions had been met: 1) The riders were fit and supple enough to ride through the bucks, stay on and just keep going. 2) Their seats were sufficiently independent to not hang on for dear life. Through the riders' quietness, their unobtrusiveness, their horses came on their bits of their own accord! I saw it work at home - with my training horses and with my students. When the horse was warmed up (without a rider hanging on the reins), resistance faded. It's not a natural human inclination (at least not in the Western hemisphere) to just let it happen. As American dressage riders, we want to study and to perfect the movements. "What can we do to make it happen?" German dressage riders are called "saddle squeezers". They put in the time - saddle between horse and human. Years ago I observed a noted western Arabian horse clinician who, when asked about his "secret to success", replied "lots of wet saddle blankets". Join me on the journey through that door, a door that illuminated a path to enlightenment in the ongoing search for the truth: dressage. There is no step on the training pyramid called "elasticity". Elasticity is the wonderful successful marriage of the first three steps of the training pyramid. It promotes muscles that are "supple and loose". It results in greater suspension, expressiveness and a word Alex often uses: "joie de vivre". Elasticity is the most satisfying benefit - so far - of my lessons with Alex Wortmann. The reason I mention elasticity now is because it has been one of the first - and enduring - aspects of Alex's lessons that have set them apart. Everything described below must be preceded by the 20-minute warmup discussed in the last newsletter. In my very first clinic with Alex he asked riders to sometimes vary the tempo. Tempi differences he calls it. He might ask the rider to slow the tempo on the short side of the arena and to speed it up on the long side. Or he might ask the rider to lengthen the frame on the open side of the circle and then shorten it on the part of the circle bounded by the walls. He might periodically vary posting and sitting trot. Anyone showing at training level is familiar with the free walk and the "stretchy chewy circle". Yet, in retrospect, these parts of a dressage test seem overly structured and contrived. They are demonstrations of longitudinal suppleness. But Alex uses periodic longitudinal suppleness throughout his work phase. I used to think of lengthening of the frame as a reward after more collected work. Well, it is. It is also an integral part of the work itself. When I first rode with Alex, I felt I needed a certain relaxation of the horses back before I could ask for contact. But Alex had me put my young highly excitable Hanoverian/TB mare immediately on the aids. It was through contact that she learned suppleness. It was through suppleness that she eventually offered contact that was more genuine. Alex offers an evening lecture as part of every clinic. Far from dry, Alex's lectures are animated impassioned attempts to help us understand. In Germany he says theory is not taught when the rider is astride the horse. It is taught in the classroom. In one of his theory lessons, Alex carefully explained rhythm and then suppleness. As he described in his series of articles in the Centaur, if one adequately addresses rhythm and suppleness, "You get contact for free." What does that mean? It means that the horse searches for contact. His body is sufficiently supple that the horse reaches for the rider's hand. When the hand shortens the rein, there is no resistance. He is happy to work in the shorter frame. The horse exhibits longitudinal suppleness. This is why brief periodic lengthenings and shortenings are so helpful. They allow the horse to balance and strengthen his own body. They develop trust and reliance upon the rider's hands. I feel I have soft hands. I am a relatively small, soft-spoken, gentle person. Horses seem to like my hands. Yet I have lot more work to do on my hands. I still have not achieved a supple thumb. According to Alex, the thumb should rest on top of the rein, flexed like a little roof over the index finger - never flat, never exerting pressure - as these two acts rob the hand of its own elasticity through the wrist. I try to imagine little fairies flitting above my thumbs, lifting the little A-frame roofs ever so slightly. How does one achieve elasticity in the horse? Through frequent variations of the length of frame - with or without variations in the length of stride. Through leg yields where there is flexion but not bend, where the angle is correct (35-40Ã,Âº), where the horse's inside hind leg comes under his body - not crossing too much, where throughness is felt from the horse's inside hind leg up through a soft undulating back, through a relaxed neck to a softly receiving outside hand. The above sensations also apply to circles and bends - that the rider feels the inside leg come under the body, that he/she feels the energy go through to the outside rein - that the inside rein is not blocking. Through proper leg yielding, circles, bends and changes of frame, the horse comes to seek the reins. The horse draws on the rein - a feeling described as that encountered after throwing a stick attached to one end of a string over the side of a bridge and into a stream. It's like a small fish on a fish line, not a big fish pulling to escape, but a creature that is your playful but ever-present partner - one who seeks and listens to your aids. Alex says that every time he mounts a horse, he checks for longitudinal and lateral suppleness. I do this too when I mount a student's horse. When I cannot feel that reaching for the reins, the searching for contact; when I cannot feel the bend of the horse into a gently yielding outside rein, I feel a sense of loss for both horse and rider. "You are missing," I say, "one of the great (however elusive) rewards of horseback riding - the oneness, the elasticity, the give and take of a combined horse-and-rider organism, a listening, an asking, no struggle. Please do not stop searching for these feelings." The more one learns about horseback riding, the more one realizes it is feeling more than doing. It is allowing more than forcing. It is listening more than telling. These are the true joys of riding - perhaps of living. Sometimes it takes a lifetime to learn these things - especially for those of us who want to make it happen. The plan was "cooked" before I laid eyes on Alex Wortmann before our fifth clinic with him in August 2002. My husband, Jim, and Alex had talked about it in the car on the way from the airport. "There is only one route to improved riding: six months of seat lessons every day." OK… We had employed an instructor at the time who could teach me. We had three big moving German horses. No problem. But here comes the kicker… No other riding. No training. No trail riding. Nothing. A big tear welled up in my eye and rolled down my cheek… to no avail. Alex had long ago said he was impervious to tears. So we shut down the arena from 9-10am Tuesday-Sunday. I'd get a horse out at 8:30am and tack him up. Starting at 9am Barbara lunged one of these ambitious four- or five-year-olds. I hopped on about 9:30. Generally it was 20 minutes a day - six days a week, four months straight. At that point Alex said, "You're off the hook". I looked forward to and enjoyed my seat lessons. I soon learned that they are not just about correct position. They enable one to drain every ounce of tension from one's body. Hence, remarkably, they enhance the quality of one's life off the horse as well. Seat lessons - especially a long duration of nothing but seat lessons - gives one a new outlook on his/her relationship with a horse. There can be no focus on control. There is nothing to control. You become an innocent bystander - a rag doll atop a charging steed. You can't grab with your hands. You can't grab with your legs. You can't tip forward. You can't be tense anywhere. You have one job: stay pleasantly, quietly atop the horse. My personal goal was to ride bucks and spooks without tipping forward and grabbing. It was exhilarating when I accomplished my goal. It was freedom - a combination Pegasus-Centaur. The horse was airborne. I was part of him. It takes a long time to eradicate tension. I learned to identify and deal with every part of my body that was and could be tense. My neck was my last bastion. I could feel it stiffen during transitions. I learned to figuratively attach helium balloons to my helmet. It helped my horse when I lengthened and freed my neck. We all want our horse to free their necks. How about starting with ourselves? I was able to concentrate on keeping my eyes up. The technique I used (and must keep reminding myself) is that looking at my horse's neck or the ground was like inadvertently looking at something I did not want to see. (In my case this was a naked person. Caution: this does not seem to work with men.) Good little girls are taught to avert our eyes. It becomes a reflex. I taught myself to keep my eyes to myself - straight ahead. I quickly learned that a by-product of not looking down is feel. If you can't look at your horse, you must feel what he is doing. Aha - another light bulb moment. Although after four months Alex said I was "off the hook", I did not feel I was ready. I could not sit the trot to my satisfaction. So for another six weeks, Alex instructed me to do the following: attach a "steadying line" to the little rings on the front of the pommel of the saddle. Gerhard Politz had called it a "safety strap". Catalogues call it a "bucking strap". Alex is emphatic that the strap is not to be grabbed, but to steady oneself. Here is the plan: Hold the reins as normal but link the little finger of each hand through the steadying line. In my beginning work off the lunge with the steadying line, I also rode with side reins. This enabled the horse to be round without the use of my hands. At first Alex had me ride with my hands always on the steadying line. (Of course I still had to work on not being tense anywhere.) Gradually I could ride with my hands only on the bridle reins - only for a short distance until my position became insecure. Then it was back to the steadying line. I was teaching myself to never use the bridle reins for balance. I have since seen the steadying line work wonders for my students. Just bop around for 30 minutes or so - little fingers looped under the steadying line - with or without stirrups. Once the rider relaxes, the horse does too. The horse goes forward more willingly - actually volunteers to go forward as each of us becomes more supple. As we become supple, life becomes much easier for the horse. We've all seen it before - big moving warmblood horse, rider unable to go with the movement - stifling the movement of the horse. Don't let this be a picture of you! I realize that four to six months of daily seat lessons are beyond the means of most riders. I calculate the value of my lessons to be $3500 at the going rate at our stable. If you are thinking of buying a $35,000 horse, the added investment in your body will make the investment in the horse that much more worthwhile, not to mention more enjoyable for both you and your horse. For us professional trainers (who probably need this work the most) the cost is even more dear. Can you imagine how I felt for six months not training? I felt like the littlest, least experienced rider in my barn. Sure I probably lost credibility. Everyone no doubt thought, "She must be really bad. Alex didn't say that I needed seat lessons." I've since learned that Alex throws down the gauntlet to only those whom he feels might take up the challenge. So what about YOU? Next winter consider a steady four- to six-month diet of nothing but seat lessons. You can always lunge your own horse, work him in hand or have a trusted person ride him. Not up to the challenge? Then buy a $20 steadying line. Ride with the fingers around the steadying line for six weeks or so. Feel how much it improves the partnership with your horse. It's a technique Alex uses often - over cavaletti and jumps, with or without stirrups. The changes you feel in your body and in your horse are worth it. Try it. You'll like it. Your horse will love you. Why do we love horses? Some of us are just born that way. It's genetic programming. We can't escape it. We can't alter it. We must live with it. Why do we love dressage? Because it improves the horse, any horse - for any discipline. One perfects an enduring partnership through dressage. One develops the horse physically, mentally, emotionally. It makes what is best about the horse even better. Correct dressage training stays with the horse. It prolongs his useful life. For over thirty years my husband, Jim, has taught students to train their own horses through dressage. Jim and his former wife, Phyllis, were students of Violet Hopkins. Jim does have a great eye for horses with athletic ability. Where we have erred over the years is in continuing to work with horses that don't have the best mind for working. They've had their own issues, mostly getting tense at outside influences. Some too have had their own internal agendas that are not necessarily work-oriented. Jim and I have long prided ourselves in sticking with a horse and working through his problems. It does make us very effective in working with people and their own horses. We have long derided trainers who say, "Get rid of that horse." Our attitude has been great for "building character". We help people to understand that working with a horse is no different than rearing a problem child, supervising a difficult employee or building a successful marriage. Enter Alex Wortmann. For three consecutive clinics, Alex helped me struggle with a very difficult Oldenburg NA mare. He finally said, "In Germany hundreds of years ago this bloodline would not have been allowed to continue. If a modern-day breeding ever resulted in a horse like this, she would be destroyed. It would be an embarrassment to the breeder to have it be known that such a horse existed." Strong language. Much different orientation. How much of our life here in the US is spent trying to repair a defective (sometimes still hopelessly unsafe) vehicle? How about getting one that just plain works in the first place? I took Alex to lunch in a remote and funky mountain bar. He lay it on the table, "How many years realistically do you think you have left?" I was 55 at the time. "How do you want to spend those years? Working with the same type of horses? Why not get a horse that you can advance and really enjoy?" I'd been studying the German "pyramid of training". It has been hundreds of years in the making. But so have the German warmblood breeds. Jim and I decided to buy a horse sight unseen during Alex's next trip to Germany. Actually he found two: one for me and one for Jim. That was just the beginning. Our stable's ninth German horse arrives later this month. When someone asks me about what horse to buy for dressage, I now say, "We only recommend imported German horses." Each is slightly different in his training issues, but they all have the same characteristics in common. They have wonderful dispositions, a strong work ethic, a willingness to please. They have unlimited athletic potential. Grand prix? Of course. They are bred to do grand prix. No working for years and reaching an impasse. They are affectionate, observant, appreciative. "Dumb bloods?" No way. They all have beautiful faces. They all have beautiful minds. Their gaits? "To die for." Don't be mislead by American-bred warmbloods. There may be some fine ones. There are also some very bad ones. These bad actors have given warmbloods in the US a bad rap. This is not true with the German warmbloods we have imported. They are uniformly wonderful. Granted, with each one we learn more. If we had stopped after importing a horse or two or even three, we wouldn't have advanced our skills and knowledge as we have. Furthermore we would have been nowhere without Alex Wortmann's continued guidance. Like he says, "I'm here every 4-8 weeks. Nothing can get too far off track in that short amount of time." The good news? The horses progress every single day. What a joy! Any delays or detours are due to our own lack of understanding - never the shortcomings of the horse. Alex gets us right back on track. No problem. The bad news? We have too many horses. One of them with his bright eager eyes awaits you. We told Alex, "We'll never be able to part with any of them. They are just so wonderful." But Alex says, "We have an unlimited supply of them. You can always get more." It's a hard concept for us who have historically kept working with the same difficult horse year after year. "You can replace this one with another one just as nice." After nine horses, we finally do admit that it's true. Now, how many years do you have left? Even if it's fifty more years, the clock is ticking for you too. Love dressage? Buy a dressage horse. With the right material, you can really start learning. Four young girls stood together, nervously awaiting their turns to be examined. In the next aisle they could hear several German voices asking and answering questions: those of the examiners and those of their fellow German riders. We were the four girls: Brooke DeVore, Katryna Evans, Claire Filkins, and Audie Shushan. We wish to share our story of our exciting trip to Germany. Here we learned more about the German way of riding and worked towards our Little Bronze Medal, which is the license for competing at low levels (training through second level) in Germany. "I have to say I never knew when I started riding at Anchorage Farm that I would ever be going to a foreign country to complete the Little Bronze Medal," said Katryna. However, we were offered this chance to travel to the true heart of horse country thanks to Alex Wortmann, our trainer from Germany. We were all awed at this chance to not only go to another country and work for the medal, but also to have the privilege to visit Stall Ramsbrock. It was from this stable that Kris and Jim Cooper, owners and trainers at Anchorage Farm, have imported all nine of the German warmbloods currently residing at their stable. At Stall Ramsbrock stallions ran free in wide open pastures and horses rested in every corner of the barns. We were in awe for days at this magnificent atmosphere in a horse facility unknown to most American riders. It was here at Stall Ramsbrock that Claire Filkins would find her equine soul mate, Rogue's Respiro, who now resides at Anchorage Farm. "It was all so amazing, just to see the riders and how different their riding was compared to that in the US," said Claire." It was very inspiring. You could see how hard they worked. Yet they made everything look so easy." Ms. Wilcox and all of the riders at Stall Ramsbrock have solid, yet soft, hands and great positions. We were very impressed by the power and finesse of all the dressage riders and jumpers, not only at Stall Ramsbrock, but also at the academy where we took our exam. The riding academy, "Landeslehrstatte", gave us true insight into the German way of horse management and riding instruction. During the two weeks that we were there, we received helpful lessons in dressage and jumping. The head of the academy is the greatly respected Hanno Vreden. He helped us prepare for the exam by giving us the time and patience that helped us improve as young riders. Our training in the US and a few weeks in Germany finally added up to the Little Bronze exam. We as riders were tested in every aspect of our knowledge of dressage, jumping, and horse management. We all looked our best in black and white show outfits with show-ready horses. The excitement built up with every tensing moment after each test. All the tests were finally completed. We eagerly awaited the results. After what seemed an eternity, the judges came out with all the medals. Everybody looked yearningly at the prizes that lay on a silver platter until the judges announced that everyone had passed. Great sighs of relief were heard throughout the room. We knew that the memories of this day would be embedded in our minds forever. It's not natural. Using one's hands properly while astride a horse is not by any stretch of the imagination a "natural" thing. I often tell my students that riding is not "ergonomic". If a human designed a horse, the buttons would definitely be in different places…. It's first evident with the pre-schoolers I teach. Put a three-year-old on a horse for the first time, and a gaggle of admiring relatives will inadvertently say, "Hold on!" An adult beginner seeing a dressage saddle may panic, "Where's the horn?" Every day we, as dressage instructors, caution our students against doing too much with their hands. But what about ourselves? I didn't think I took back with my hands. That's not what I teach. But guess what? Years ago I learned this: videotapes do not lie. Another eye opener to me was my auditing of a clinic at our stable. I could not ride due to a case of walking pneumonia. I sat silently by Alex ride after ride, always imagining, "What would I say if I were teaching?" and "What would I do if I were riding?" I caught myself. There it was! Too much hand! How did Alex work with my offending hands? First of all, he took away my reins for four months straight. As I wrote in my Centaur article on "The Seat", four months of nothing but seat lessons, in retrospect, didn't feel like enough. I was just starting to feel a whole new relationship with the horse - one based on staying with him and not against him. Even when I was off the lunge line and had the reins back in my hands, I wasn't allowed to do anything with them - not for months. It was "hands forward", down on the withers. Horse forward. Hands forward. When I was allowed to pick up my hands, the nit picking really began. "Supple thumbs." "Reins exactly the same length." "Bight on the right." "Shorten the whip in your hand." (It took me a while to figure this one out, but a balanced whip does not restrict the hand - same with a supple thumb.) "Rein pressure exactly the same in both hands." "Your left hand has a death grip!" "Hands forward, never backward." "Don't fix it with the hands!" Alex taught me to do leg yields without the hands. "It's a leg yield, not a hand yield." Turns on the forehand without taking back with the hands. Halts by simply lowering the heels. Turns and circles with the body and legs - no hands. Hands forward in the corners and in transitions. If the horse fusses, hands steady, drive! "Don't fix it with the hands!" What is the result? For myself, it is the incredible feeling of throughness - where the horse comes to the hands like butter, seeking, trusting my hands. I know. I know. We all think we are doing this. Are we? My horse feels like an accordion. I shorten my reins. He comes to the shorter reins. I don't hold him in a frame. I merely establish the parameters and always having the feeling he is going to my hands. If he leans on me, I drive him forward to my hands, then release my hands a tiny bit forward so he comes to my hand again. Hanging on the horse's mouth deadens his spirit. It muffles communication. Taking back with the hands shortens his stride. It destroys the swing of his hindquarters. I have found two video series that support and illustrate what I've been learning. Beth Baumert in The Six Ingredients, talks of an image also used by Sally Swift in her book, Centered Riding. "Imagine there is water flowing from your elbow to the bit. You can't bring the water back. You can only shut it off and send it forward." Walter Zettl's tapes offer the best illustration I've seen so far of horses going to the riders' hands. It's a long path of learning and self-discovery: finding the buttons that are not ergonomic ones. Stick with it. The rewards far exceed the sacrifices made. Everyone has his/her own "Land of Opportunity". Some may go to Paris, France, to study architecture. Some may travel to America to explore. Some may think they find plenty of opportunity in their own hometowns. Whichever way you see it, there is always opportunity for someone, whatever one's interest. My "Land of Opportunity" happens to be the wonderful land of Germany. For here is the truest experience of horse training and breeding. So often one hears about what the Germans do with their training and their horses. United States Olympic riders train in Germany. We all have a pretty good idea of the strength and knowledge the Germans have in this particular study. Few people, however, even imagine flying over the Atlantic Ocean to learn firsthand about horses from the Germans - especially a thirteen-year-old girl from a small town like Bailey, Colorado. That teenaged girl is me! It all started in the winter of 1996-7. I started horseback riding when I was seven years old. Little did I know that one riding lesson per week as a fun activity for a young child could later turn into a way of life for me, a young teenager. I'm sure I can speak for all of you who starting riding when you were younger. All you wanted to do was to be with your favorite "pony". Some of us love to ride the speedy ones. The faster the better! Some of us like to take it easy and enjoy the ride. For me every second with a horse was and is fun and exciting. I've now been riding for seven years as of last January. Never in my dreams would I, however, have imagined going to a foreign country to be with horses. But here I am writing to you from a room, which is actually above a barn full of young horses. I'm waiting to go the training barn to enter the world of German horse training. Come along with me over the next two months as I enter my own personal "Land of Opportunity". Katryna Evans, a student at Anchorage Farm, is currently studying horse training for three months at Stall Ramsbrock, Menslage, Germany. There she rides up to four young horses each day and works alongside the Lehrlingers (apprentices), Bereiters and Masters. Katryna helped select for Nicholas Sigler, a fourteen-year-old from Evergreen, the five-year-old Royal Diamond son pictured here. Congratulations Nic! Katryna intends to keep us informed in the Centaur of her experiences over the next two months in Germany. Katryna's Rhinelander gelding, Roswell Wizard, was reserve champion Jr/YR RMDS training level horse of the year in 2003. I have been here at Stall Ramsbrock for two months. Everyone is asking me, "What are you doing differently?" "What have you been learning?" These are not questions that I can simply answer. The explanation would be so hard to put into words. What I can tell you is that nowhere in the US could I get the same experience that I am getting here in Germany. The German system of riding seems so complicated yet so simple, so obvious yet so surprising. I wish I could explain it better, but I really am at a loss for words. It's not something anyone can begin to understand just by reading this article or by reading a book. As they often say in Germany, "The only way you can learn to ride is by riding". From my observation, many riders in America want a "recipe". If you can buy an expensive horse, get the right equipment and a dressage trainer to tell you all the little steps, then they think they have horse training. Not so! One of the biggest differences between many riders in America and the good riders in Germany is one word: forward. Young horses at Stall Ramsbrock are mainly ridden forward and round. As they say here, "Let them motor through their backs." That's the only way for the young horse to find his balance and become supple and relaxed. Before I came to Germany, I always had a slight amount of doubt about what forward riding can bring. But as I ride these young horses, I learn and understand better and better just how important forward riding is. You can fight with a young horse all you want, but to really get them to be willing and to come through, they need forward. And as I have heard over here many times, all corrections are to be made forward. Now, of course, that is much easier said than done, especially to be done correctly. You must understand that I am only beginning to learn the German system. I have so many different thoughts, opinions, facts and information. That is a lot for a thirteen-year-old to handle. So please bear with me if I can't put it all into plain words. As I have been here, I have been riding up to six young horses every day. It's amazing how much you can learn from riding so many different horses. Some of them are big, some small. All of them teach me something new. Katryna Evans, a student at Anchorage Farm, is currently studying horse training for three months at Stall Ramsbrock, Menslage, Germany. There she works alongside the Lehrlingers (apprentices), Bereiters and Masters. Among others, she rides prospects for the 2008 Chinese Olympic team. Katryna intends to keep us informed in the Centaur of her experiences in Germany. Katryna's Rhinelander gelding, Roswell Wizard, was reserve champion Jr/YR RMDS training level horse of the year in 2003. Katryna's experience was made possible through the generous patronage of Heinrich and Dagmar Ramsbrock and Alex Wortmann.